Courtesy of The Real News Network. Watch the video here. Read the transcript below. Heidi Garrett-Peltier holds a Ph.D. in Economics from the University of Massachusetts, Amherst and works as an assistant research professor for Political Economy Research Institute (PERI). Her research focuses on the employment impacts of public and private investments, particularly in the realm of clean-energy programs. Heidi has written and contributed to a number of reports on the clean energy economy (see Recent publications, below). She has also written about the employment effects of defense spending with co-author Robert Pollin, consulted with the U.S. Department of Energy on federal energy programs and is an active member of the Center for Popular Economics. SHARMINI PERIES: It’s the Real News Network. I’m Sharmini Peries coming to you from Baltimore. A new study by the Watson Institute at Brown University shows that defense spending is an inferior way to create jobs. The report, authored by Heidi Garrett-Peltier, compares how many jobs are created for each million dollars of public spending in different sectors.President Trump boasts a massive increase in military spending, and also promises to create jobs for Americans. Can the two things happen simultaneously? To discuss this question, I’m being joined by Heidi Garrett-Peltier, the author of the study that I mentioned. She is an Assistant Research Professor at the Political Economy Research Institute, PERI, at the University of Massachusetts, Amherst. She is a researcher in the impact of public and private investments on employment, especially investments in low-carbon economy. She authored the book, “Creating a Clean Energy Economy.” Heidi, I thank you so much for joining me today. H. GARRETT-PELTIER: Thanks very much for having me, Sharmini. SHARMINI PERIES: Now Heidi, before we get into the nitty gritty of this study, let’s start off by giving us a sense of your general hypothesis here, and why you conducted this particular study in this economic climate. H. GARRETT-PELTIER: Sure. We often hear the argument that military spending is good for jobs. And there are certainly lots of different sources of support for military spending. Military spending happens in just about every Congressional district, if not every single Congressional district across the U.S. So there’s been a lot of support for military spending. But one of the main arguments that we hear is that it’s good for job creation, and this argument has been around for decades. It used to be referred to as “military Keynesianism.”And so what we wanted to do was look at the question of how does public spending affect job creation? 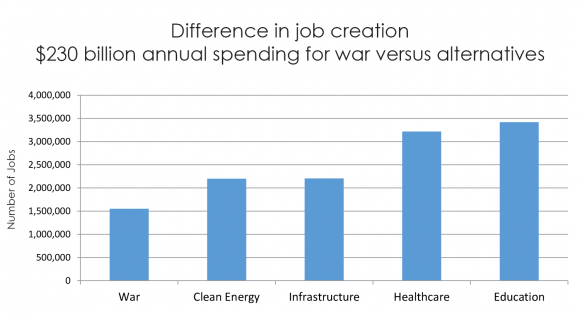 And if it’s true – and it is true that military spending creates jobs – how does that compare to other sectors? How does that compare to job creation in clean energy, or infrastructure, or education, or healthcare? So we’re not just saying “Does military spending create jobs?” It’s not a ‘yes’ or ‘no’ question. It’s what is the alternative? Is it the best way to create jobs? Could we be creating more jobs investing federal dollars in a different way? So that was really the overall theme that we wanted to look at. And the hypothesis was that some of the other sectors of the economy would actually create more jobs than the military. SHARMINI PERIES: Now Heidi, during the Cold War, the U.S. spending on defense was even greater than today in terms of the ratio of spending to GDP. And the term “military Keynesianism” as you said, was coined by economists who argued that defense spending actually contributes to growth, which kept the U.S. ahead during Cold War, not just in terms of military power but also in terms of standard of living. What is your response to this? H. GARRETT-PELTIER: What we should really be interested in is what is the trade off? Our federal budget comes from tax dollars, and people want to put their tax dollars to the best use possible. So if we’re looking at spending American tax dollars on something like the military, we want to know that that’s actually the best use of our tax dollars. So we can look at what are the trade-offs? What does it really cost to do this?So one trade-off is if we’re investing, excuse me, if we’re spending on the military and we don’t have the money in the budget, we go into deficit spending. Then we’re taking on interest, and we’re paying interest on the loans that we need to take out for increased military spending. If we’re not doing that, then we’re taking money from another section of the budget, from other domestic spending in order to fund the military. So we are taking money from education or healthcare or infrastructure or emergency relief, which is particularly relevant right now. So we need to ask, is it worth paying the extra interest to take on this additional military spending? Or is it worth reducing spending in some other sector in order to support a greater military budget? Because those are the two choices we have. SHARMINI PERIES: Is there any military spending that’s good for the economy and for job creation? And I’m asking this because you were recently quoted in an article about the new Columbia class of nuclear submarines which cost $2.7 billion dollars each apparently, and the contract with the Navy for this was something like $5.1 billion dollars. But maybe there are other forms of spending that are more labor intensive, and are there such things that the military can do that it has a positive impact on the economy? H. GARRETT-PELTIER: Well, it’s true that within the military, there are very different types of spending. And actually one of the things that the military is doing that I find a very positive development is they’re becoming much more energy efficient and using much more renewable energy. So the military is the sector or the segment of the economy that uses the most energy of all. If you look at one institution using energy, the military is an extreme user of energy. SHARMINI PERIES: And carbon emission contributor as well. H. GARRETT-PELTIER: And, therefore, carbon emissions. Exactly. So you beat me to the punch. So they are using a lot of energy; they’re emitting a lot of carbon. And so one of the positive things that they’re doing is investing in energy efficiency and investing in renewable energy, and those are both ways to create jobs. In this case, you’re creating jobs in the military and you’re also expanding clean energy. So in that sense, it’s one of the best ways that we can spend money within the military sector.But if we look at outside the military sector, other industries, other sectors like healthcare and like education are much more labor intensive. So in the military, a lot of our spending goes not just to employ military personnel and civilians, but also to support payments for various capital, for equipment, for structures, for all kinds of capital investments. And if you compare that to something like education, where there are capital investments there, too, especially for educational buildings. But much more of the spending goes directly to labor; goes directly to employing administrators and teachers and the staff that work in schools, and that work throughout the supply chain, book publishers and bus drivers and so on. And so, it’s a much more labor intensive sector, and therefore, $1 million dollars goes a lot further in employing people than it does in the military. SHARMINI PERIES: What about the issue of corruption and transparency as far as military spending is concerned? Civilian, public expenditure is normally regulated, but with the corporations in there and the military industrial complex, military spending is much more secretive. They don’t want to have their trade secrets, A, stolen by other nations, or they don’t want other companies to steal it. And the federal agencies that actually check, do the checks and balances in terms of audits and so on, is often kept out of the process because of this, the secrecy around the model of submarine or the airplane. And so all of this secrecy is justified. So how do we actually know whether $2.7 billion dollars for a submarine is a good price, and is it a good way to spend public dollars? H. GARRETT-PELTIER: That’s an excellent question, and it is really difficult to track the money that goes through military, payments through military contracts. And this is one of the issues, is that a lot of the federal spending, a lot of our tax dollars are going to private companies in the form of contracts. And it becomes very difficult as you have a big contractor like Lockheed-Martin or Boeing, or the big corporations that are taking on these military contracts. Then they have subcontractors, and they have subcontractors, and it becomes really difficult to trace the money.And now, on top of that, you have the issue that you just raised, which is that there has to be some level of confidentiality for reasons of national security, and then much more of the money ends up being hidden. So we don’t know exactly how all of these dollars are being spent, but we know, for example, Lockheed-Martin gets upwards of 3 percent of the federal discretionary budget. So this is one company that’s getting a giant chunk of our tax dollars. And we can’t trace all of those dollars. We know the total amount that’s paid out in terms of the contract, but then we don’t know exactly where that goes afterwards. It becomes very difficult to trace. SHARMINI PERIES: Now, one argument that you mentioned is that we are spending so much money on defense, arguing that this is for job creation, and that there are other sectors of the economy that are suffering, like education and healthcare and so on. How do we actually determine what is healthy, good defense spending and what isn’t? H. GARRETT-PELTIER: You know, there are people who are working on exactly that question. So there have been a number of economists and others who have, in recent years, produced something called the “unified security budget.” And so, that looks at what do we actually need, concerned about national security. And we do think that there is a need for a defense budget. And the argument is not, in this case, to completely slash it to zero, but to look at what actually would keep us safe. And there are professionals working on these questions. How many aircraft carriers do we need? How much ammunition? How much would everything tally up to, and how does that compare to what we’re actually spending? And there are many types of weapons systems that are either redundant or that have had huge cost overruns that may never actually … vehicles that may never see the light of day, that may never be put into action, but millions and billions of dollars are spent on these. So there is a way to cut back the military budget by a significant percentage and still maintain the same level of security we have now, actually.But another question I think we need to think about is what does security mean in a broader sense? So our national security is not just the threat of attack from an outside force, but it’s also the attack from climate change. It’s the potential attack on our electrical grid that we’re more vulnerable to if we continue to have centralized fossil fuel power as opposed to more decentralized, renewable energy. It’s the vulnerability to our coastal cities that are, and to places like Puerto Rico that are just being ravaged by extreme weather events. And those extreme weather events are increasing due to climate change, due to increased moisture in the atmosphere. So all of those need to be, I believe, part of what we think of as our national security. SHARMINI PERIES: And that’s a very good point because education, having a good healthcare system, having good housing for people, are also securing the population and their well-being. It’s a good way to look at some of these issues.Heidi, I thank you so much for joining us today. H. GARRETT-PELTIER: Thanks very much for having me. Please support independent, alternative media like The Real News Network with a donation.